A bank security guard has been arrested by the police for allegedly conspiring with suspected militants to rob the bank and four others in Lagos State. Saturday PUNCH learnt that the suspects had planned to launch attacks on banks located close to creeks in the Lekki and Ajah areas of the state. The police identified the banks marked by the militants as Zenith Bank and FCMB Bank in Lekki as well as FCMB, Guarantee Trust Bank and Keystone Bank branches in Ajah. Details of the suspects were given as Abiodun Olaroye aka Gbeleju 38, a native of Ode Kreme Village Ondo State; Ebipatgh Tuwei aka Segun 47, an indigene of Arobo Ondo; Benjamin Powei aka Ben 42, a native of Arogbo Ondo, Samuel Chinedu, aka Hit Man, 30 a native Of Ika North Delta State and the 33-year-old security guard, Ikechukwu innocent aka IK, who hails from Isiagwu village, Abia State. The militants had reportedly come out of their hideouts in the creeks on Tuesday, May 30, to carry out surveillance preparatory to a multiple bank robbery allegedly slated for Thursday when operatives of the Inspector-General of Police Intelligence Response Team led by ACP Abba Kyari swooped on them. “The four suspects have confessed to being members of the robbery gang headed by a wanted criminal called America. “One of them, Benjamin (Powei) confessed that he participated in the killing of four policemen and an army Captain in Ishawo, Ikorodu,” a source said. 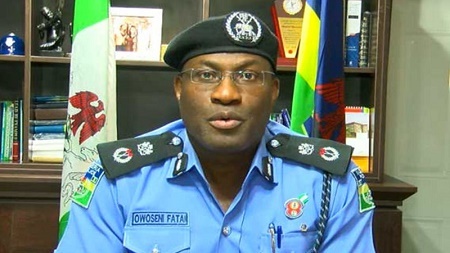 When contacted, the Force Public Relations Officer, CSP Moshood Jimoh, said he had not been briefed on the arrest and promised to get back to our correspondent. He, however, said he was aware that detectives were deployed in the areas to nip criminal activities in the bud.